This post is a part of Indiblogger & Pepsi India's #GharWaliDiwali activity, watch the official video here. Diwali, the festival of lights. India's answer to Christmas. When I think of childhood memories of this festival, a lot of happy moments flash through my mind. Every Diwali new sets of outfits would be purchased for each member of the family, and me being born and brought up in a joint family of 9 members meant tons of shopping happening! We kids of the house would give a list of our requirements to our grandfather, which would also include a list of the firecrackers, dry-fruits and sweets we want! I so remember slyly eating cashews, pistachio and aam papad that used to be kept for guests who came to visit on Diwali (and getting scolded later, but it was totally worth it!). Today, we're shopping around the year (thanks to non-stop sales online and offline). Have stopped bursting crackers because the world is already way too polluted. And with everyone conscious about their weight, consumption of sweets has decreased too. A really wide variety of sweets and savories are prepared every year- Mathri, Petha (Shakarpara), Namakpara, Gulab Jamun, Dahi Vada, Kanji Vada are the first few that come to my mind. I come from a Marwari family, if you do too, you might be able to relate to most of these. And I haven't even mentioned the grand Diwali dinner feast! It will make you forget Thanksgiving and their Turkey & Pumpkin pie for sure! For dinner on Diwali night there is a fixed menu every year - Puris, Alu ki Sabzi, Turai ki Sabzi, Raita, Papad, Moong-dal halwa, Dahi Vada,Rice, Pakodas, Chutney, Kairi ka meetha aachaar. Yes, I guess I hopefully have covered 'em all. You know Diwali is around the corner when the tedious task of cleaning the house starts. Years ago the entire family would be a part of it, chores being divided among all (children and grandparents too) equally and work getting done in a jiffy. I really used to look forward to the day the kitchen would be cleaned, because that day lunch and dinner would be ordered from a restaurant (which those days was a big thing and not a everyday thing like today). Now, with everyone busy in their jobs, this task is mostly outsourced and men come home, clean, take money and go. 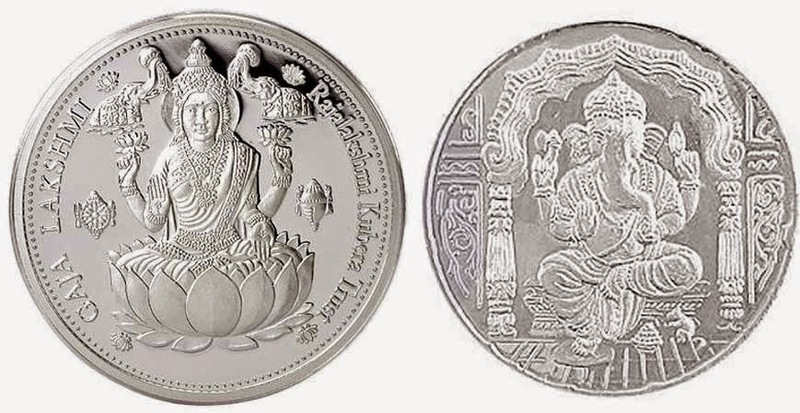 Diwali celebrations start from Dhanteras, when our grandparents go early morning and purchase gold or silver, it is supposed to be auspicious to purchase something valuable on this day. The diyas, lanterns and led lights get lit starting this day till Bhai dooj. Next comes the Rangoli and decorations. The home's entrance is decorated with a bandarwaal, shubh laabh and Goddess Laxmi's feet stickers, along with rangoli and diyas. As per traditional marwari rituals, Rangoli is made using Red and White paint, yes only those 2 colors. But now we even make the rangoli using powder colors and decorate with fresh flowers. After the Laxmi Pooja is done by all the members of the family, diyas are placed in each room of the house, youngsters take the blessings of elders, and then everyone sits for a wholesome family meal! After all, Diwali is family time. And then a day after is Bhai Dooj when the sister cooks a fancy meal for the brother/s and does teeka and gets cash/gifts in return! I always ask my brothers what they prefer to eat, and prepare something accordingly. Not to forget, there are guests coming home throughout these 4-5 days and we go to the close one's place too! Trust me, there comes a point of time when you simply cannot have another cashew or kaju katli. I got married 2 years ago and hence spent my 1st Diwali at my new home, totally missing the celebrations and festivities that take place at mom's place! But this year, I am celebrating Diwali at mom's place again, since am here for my delivery (yes baby's on its way and the due date is around Diwali only!). Now only time will tell whether I spend Diwali at home or in the hospital, but whatever the case may be, it sure will be an unforgettable one! Diwali is the festival of fun, frolic, fireworks and merriment. Share in the excitement of this joyous occasion and make your loved ones smile with happy Diwali Greeting Cards, Wishes, Messages, Quotes and Diwali Images.